I recently had the luxury of checking out Jimmy Mcintyre’s Advanced HDR Course. Jimmy is the founder and host of HDROne and if you do not have him on your Facebook friends list you should probably add him now, his posts and images are incredible! Jimmy offers an excellent training program, The Art of Advanced HDR available for just $34.99. Let me tell you, it is worth every penny. Before you begin to speculate, Jimmy did not pay me for this testimonial, I am making it because the course is… simply put… that good! I have been post processing photos in Photoshop for nearly 14 years. Much of that time was spent teaching myself the ropes from one tool to the next. However, I learned a lot and I learned it relatively quickly. When I became a photographer, naturally I used Photoshop to do all of my post processing. I continually improved my workflow as I found tricks here and there that worked out pretty well. Recently, I have become quite good at dividing my image into three parts, Highlights, Midtones, and Shadows using very distinct curves adjustments for each one. I really thought I had it down, I thought I was doing something pretty epic. It turns out the selections I was making were mere child’s play compared to what I learned from Jimmy Mcintyre’s course. You see, Jimmy uses Luminosity Masks to make some very impressive selections. Where I was creating one Highlights layer, Jimmy was making six! Likewise for the Midtones and the Shadows. With these very intuitive selections Jimmy makes precise adjustments to every detail of the image at even the most minute level. In Jimmy’s course he explains it all to you and walks you through his process of creating amazing HDR images without relying on excessive software and/or plug-ins. Jimmy’s Advanced course will take your cookie dough post processing and carve it into wood with utmost craftsmanship. He is very good at explaining the process and walks you through the convoluted Luminosity mask process making it seem like second nature in minutes. There is an Action available with the download that sets up the Luminosity Masks for you. A time consuming task is made effortless with the Action that Jimmy created for the course. This is great because it allows you to focus on the training rather than the creation of the Luminosity Masks. There are 5 videos, one that is very basic and covers the Luminosity Mask creation process and the theory behind their benefit. The subsequent videos are specific to certain images that Jimmy offers in the course for you to follow along with. There is a bonus tutorial that outlines the benefit of using Adobe Camera Raw to edit 32 bit HDR images. The best part, your images will look better after this training. Your workflow will benefit greatly from the knowledge you will receive about Luminosity Masks from Jimmy. Take it from a 14 year Photoshop veteran who thought he had nailed his workflow! The only problem I see, your workflow time will increase. I am all about efficiency and processing my photos quickly, however, this is a very daunting process that requires a lot of brain power and tedious, but necessary adjustments. It really is bitter sweet! However, the excellent final product of your post processing efforts will shine through the additional amount of time. This course has definitely improved my workflow, made me more conscious of my post processing decisions and most importantly dramatically increased the quality of my final images. You should know that this is a rather advanced course. While Jimmy does a great job of walking you through the process, it will take quite a bit of Photoshop knowledge going into it. If you are new to layers and masking, you may find it difficult to comprehend at first, however, if you follow along with Jimmy using the provided source images, you will master them in no time. This is an excellent buy at just $34.99. Don’t spend another ounce of money on software or plug-ins until you check it out! 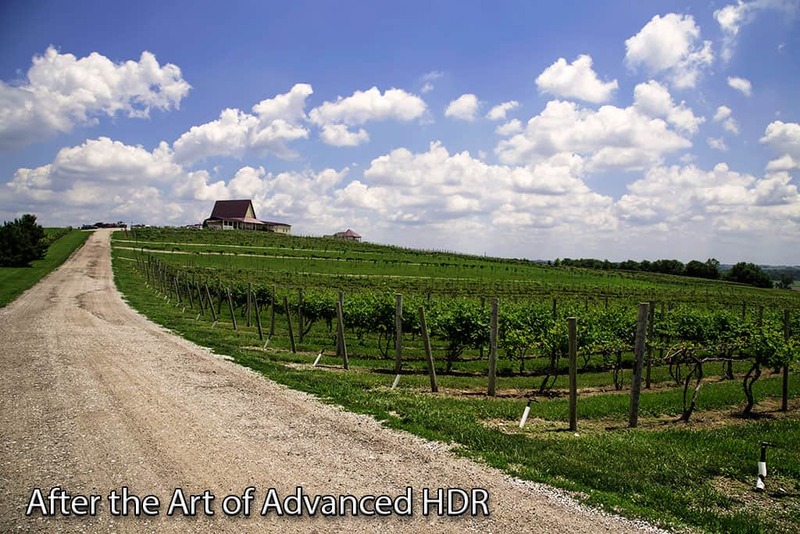 Purchase the Art of Advanced HDR by Jimmy Mcintyre at HDROne. Jimmy’s photos are amazing and he admits that he loves spending lots of time post processing. It’s great that he’s put his knowledge into this course for those with the stamina to learn it all and then apply it to their workflow. I haven’t seen this course material and it sounds like it’s not really suitable for beginners to HDR or those who are not familiar with Photoshop or people who love HDR but don’t want to spend a lot of time learning software? Good HDR, like yours and Jimmy’s, is beautiful. It’s just too bad that the learning curve with this workflow is so steep. Thank you for the review, I was curious about the course. Can you tell me if he recommends Photomatix Pro or has another favorite method of tonemapping, perhaps right inside Photoshop? Yeah, unfortunately making great images does require a lot of time. However, once you get your groove down it can go very quickly. I have mine nailed down pretty well so each photo takes anywhere from 15-30 minutes a piece. The ones I really care about may take 30 minutes to an hour. That is completely justified time for making a great image. The course is designed for those who knwo the ropes of Photoshop, but he also does a good job teaching you what you need to know. I am not sure what he reccommends. I use the Luminance Masks he discusses in unison with my TIFF workflow. It works impeccably well! I discovered luminosity masking when I stumbled on Tony Kuyper’s site last fall. He has a lovely set of blog posts and tutorials but Tony must have a really detailed mind because the material is quite dense. It is about as much fun to read as your college calculus text book. I do love Tony’s action set that can be purchased – especially the ‘Triple Play’. It comes in the form of a TK action panel that works with Photoshop, so all of the actions are available at the touch of a button. Recently, Sean Bagshaw produced some wonderful videos based on Tony’s work. There hours and hours of videos with a detailed and comprehensive discussion of luminosity masks. I have to say, I wish I had started with Jimmy’s videos first (which hadn’t even been created at that point), which are not quite so dense. If you really want to know more about luminosity masks, you might move onto Sean’s videos, which are pricey, but really detailed. And if you realllly want to know more, visit Tony’s site. Excellent intel Jennie, thank you for the referral. I will be sure to check them out as this luminosity mask stuff is pretty incredible! Is there any way to convert info for use in Elements? I use that and Color Efex (bundle) with it’s HDR program as well for editing. Not quite sure, I am purely a PHotoshop dude, I know that is not what you want to hear, sorry!